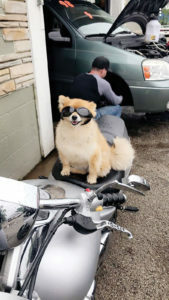 Ace dons doggles, rides motorcycle. 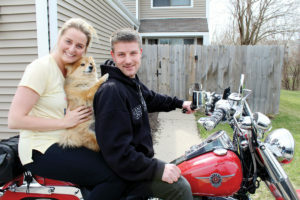 Lance Leinen and Alicia Wright take Ace on motorcycle rides. When the Animal Rescue League announced a grand marshal for its Dog Jog & Fido Fest, it was between a black pug named Lily and a Pomeranian mix named Ace. As the two sat next to their owners at the ceremony with wagging tails, Ace was crowned the winner and named the grand marshal. He and his owner, Alicia Wright, then led the parade of dogs. It’s not every day a dog gets named the grand marshal. After all, a grand marshal must have exceptional qualities to deserve a place of honor as a parade leader. So how did Ace get dubbed with this distinction? His owner, Alicia, explains more. In July 2015, Alicia took her young nephew to the Animal Rescue League (ARL). It was a rainy day, and it was a fun outing looking at animals. Alicia saw Ace, who recently arrived at the ARL as a stray. His matted fur showed skin and bones, and he was severely underweight. He had a ruptured eardrum, kennel cough and seizures. He’d jump and growl if a foot came near him, and he was thought to have suffered abuse. In Alicia’s job as social worker in the mental health field, she often shares her story of Ace, how he was neglected and brought back to life. “The pictures and story of Ace brings a positive story to my clients. By sharing this story, it shows that people, too, go through difficult times and persevere, just like Ace,” she says. And that’s how he became the grand marshal. By sharing her story with the ARL, she wrote an essay as to why Ace was unique. People voted online, and Ace was crowned the winner in 2017. Although Ace doesn’t know he’s a celebrity, he’s been treated as such. Alicia’s mom had professional pictures taken of Ace, and her wall is adorned with framed photos. “It’s like her first grandson — or grand dog,” says Alicia. The rescued canine likes to dress up and wears doggles. One of Ace’s favorite pastimes is riding on Alicia’s boyfriend’s Harley Davidson Fat Boy motorcycle. With a special harness attached to his owner’s body, Ace dresses for the occasion, in leather, wearing doggles (dog goggles). “When we rev up the motorcycle, he knows he’s going for a ride and loves to jump up on the seat,” she says. Alicia drives alongside on her Honda CR 250, and people often honk and wave at the couple. Alicia says Ace has helped her through difficult times, and she admits that she spoils him.